I enjoy very much West Edge Opera's theatrical creativity. This summer from July 25 to August 9 they will present 3 operas, each in its own venue. And none of them are theaters. What! Another Lulu? 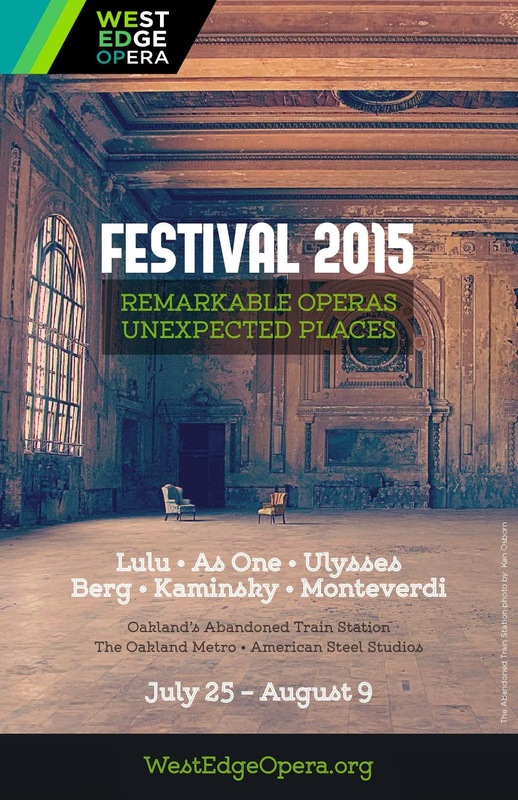 It's everywhere, and this one will be presented in Oakland's abandoned train station on 16th street. Lulu will be sung by Emma McNairy. I am formally declaring 2015 the year of Lulu. In addition to this performance it will simulcast from the Met and stream from Munich. The next opera is As One by Laura Kaminsky, an opera that premiered last fall at the Brooklyn Academy of Music. And the venue is the Oakland Metro, 630 3rd st, a punk rock venue near Jack London Square. The third and last opera is billed as Ulysses but is usually called Il ritorno d'Ulisse in Patria by Claudio Monteverdi. This opera has a very cool contralto role. It's venue is American Steel Studios at 1960 Mandela Parkway. This is sort of an architectural tour of Oakland. After abandoning El Cerrito High School, West Edge has been homeless. I am very much attracted to this creative solution. I find it all very exciting.